"the best GMAT exams available"
Thousands of business school applicants are earning higher scores with more reliability than ever before. 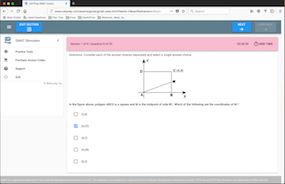 With the CATPrep GMAT exams, they have access to the most realistic test preparation software available - the exact same blueprint for online success - that we're using to help students of the world's best GMAT preparation courses crack the GMAT. And now you can take advantage of this too. With the CATPrep GMAT exams, you'll dramatically enhance your preparation for the GMAT while improving your scores - and you'll do it systematically and consistently. The style of questions, difficulty level, and the final score received on CATPrep's GMAT Simulator are all very accurate. Great tests! We use your simulator in both our live and online GMAT courses and have been genuinely pleased with its ability to gauge our students' levels of preparation and to familiarize them with the actual exam. We have used your practice tests for several years with great success. As a top 1% firm for GMAT and GRE, we're highly selective about the products that we use, and have found no better practice test on the market today. It complements our curriculum by offering the best test questions that reflect the actual exam, and a question pool depth sufficient to ensure accurate feedback over a wide range of scores. The #1 key to GMAT success is smart practice. On test day, when the timer starts blinking at the 5 minute mark will you panic or will you calmly strategize to leave no question unanswered? You'll handle it well after practicing under the realistic conditions of our GMAT Simulator! The GMAT is primarily testing your endurance under stress. You can have all the verbal and quantitative knowledge you need to ace the test, but if you can't rack your brain under pressure for a grueling 3.5 hours, you're not going to score well on the GMAT. Relieve test day stress with our true GMAT length smart practice tests - guaranteed to enhance your preparation and overall score! They call the GMAT a Computer Adaptive Test because...the test actually adapts to your performance! The GMAT chooses your next question from a large pool based upon question difficulty and your current score. Most practice tests present the same static set of questions to every student - completely inadequate for proper preparation. Our accurate reproduction of the GMAT's question selection algorithm uses hundreds of questions of predetermined difficulty to provide the most realistic GMAT practice tests available anywhere! The GMAT scoring algorithm assigns more weight to the first questions in a section as it attempts to narrow your potential to a given range. Additionally, an unanswered question lowers your score more than an incorrect answer. Our practice tests include an accurately reproduced scoring engine with these characteristics that truly separate it from any other practice materials available. I just wanted to write and let you know that when I sat for the GMAT last week I was blown away by how well your practice tests had prepared me for the experience! My roommate sat for the real GMAT a few weeks ago and canceled his score after he panicked on the quantitative section. I used your software to become familiar with the test and aced it on my first try! "Truly Realistic" I sat through one of the more reputable prep courses before augmenting my study plan with your software. Your tests were much closer to the real thing than *****'s practice exam...and a far better value! Xia raised his total score 110 points and earned an official GMAT score of 750 with a 6 month study regime built around our GMAT Simulator. Our question pool has been updated with the newest question types to appear on the GMAT test, and high scorers will encounter the more difficult probability questions that are starting to appear on actual GMAT tests. If your practice material is divided into five sections with two verbal and two quantitative sections like the old GMAT Paper-Based Tests, you are not practicing with current material! If you plan to invest the time and effort involved in sitting for the GMAT test, you owe it to yourself to take advantage of the features of our exclusive and complete CATPrep Simulator for the GMAT Test! We guarantee our GMAT practice test software will better prepare you for the real tests. If you are dissatisfied with our practice tests for any reason, we will refund 100% of your purchase price.